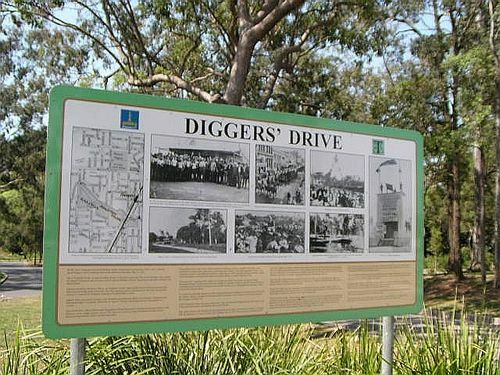 Diggers Drive commemorates those who served in World War One, and was officially opened by the Governor of Queensland, Sir Matthew Nathan on the 31st May 1924. After World War One, 83 returned soldiers were given employment. They were from Kalinga Division of the shire as well as from other metropolitan and suburban areas across Brisbane. Their effort resulted in the formation of roadway in Kalinga Park, the planting of 120 trees in Hendra and Kalinga Parks, and other filling, and drainage and improvement work to improve the Park. It was the committee's intention, with the consent of the next of kin, to identify and name the deceased soldiers who had originally enlisted from the Kalinga Division. This was to be done with inscribed metal plates, that were to be placed on as many of the trees as necessary. But it was recorded that it had been difficult to obtain the names, and it was not possible to have the plates ready for the opening ceremony. Declaring the "Diggers' ' Drive in Kalinga Park open on Saturday afternoon, the Governor, Sir Matthew Nathan, declared that too often relief works partook of the nature of charity. The returned man did not want charity. Why should he do so when he was of the picked of the land? The drive is a splendid piece of roadway for wheeled traffic, extending over three quarters of a mile through Kalinga Park, situated midway between Toombul and Eagle Junction. There was a very large attendance of the general public for the official opening on Saturday. The Clayfield troop of Boy Scouts formed a guard of honour for the Governor when he arrived to perform the ceremony. Mr P W Bradbury, Chairman of the Toombul Shire Council, expressed gratification at the large attendance to witness the ceremony. The Brisbane Courier (Qld), 2 June 1924.